The End Times make for a good profit opportunity. Jim Bakker is selling awful-tasting survival food. John Hagee made a fortune from the failed prophecy of Four Blood Moons. Jonathan Cahn has bounced back from his failed Shemitah prophecy and is now onto other personal revelations. Mike Bickel has just published a book about the End Times, and what better place to sell it than on the charismatic false prophecy-hour known as The Jim Bakker Show? Bakker’s television enterprise, which is financially supported by a multi-millionaire who actually owns all of the Morningside property and who receives a cut of the financial prosperity sown by religiously oriented preppers, has a simple operation; use religion to scare the daylights out of people in regards to the imminent apocalypse and then bring out survival supplies that they can purchase to ride out that coming apocalyptic storm. The real fraud comes from the way Bakker does it, which is to not “sell” the survival supplies (because then the consumer and Bakker would have to pay taxes on it), but to offer the survival supplies in exchange for a “gift” to Jim Bakker’s ministry. In this scheme, Bakker’s survival supplies can be offered more cheaply than other more legitimate survival businesses, thereby low-balling the competition, while Bakker doesn’t have to pay taxes on his profit for selling goods because it’s done under the umbrella of his “ministry.” Apparently, Bickel wanted in on the action. Joining Bakker’s fear-mongering, profit-based false prophecy bazaar was NAR prophet and pastor of the International House of Prayer hyper-charismatic cult, Mike Bickel. Bickel is the leader of the International House of Prayer, which essentially grew out of a movement started by a now largely-discredited and morally-disqualified group of men known as the Kansas City Prophets. Bickel, who is a part of the New Apostolic Reformation, regularly credits infamous false prophets like (sodomite and drunkard) Paul Cain and Bob Jones, with inspiration for his own prophetic ministry. Watching other charismatic false prophets exceed financial goals and expectations by playing on End Times fears, Bickel has now published God’s Answer to the Growing Crisis: A Bold Call to Action in the End Times. So, nevermind that Bakker’s ministry license was revoked by the Assemblies of God and never restored. Nevermind that Bakker claims to have been converted in jail, but is still abusing a ministry’s 501(c)3 status for personal profit (the very reason he went to prison in the first place). Nevermind that Bakker’s “prison dream” is added onto nearly every week, as new End Times survival supply schemes are retroactively fitted in that supposed vision. Nevermind that Bakker repeatedly claims to receive new visions about when God wants him to offer specials on survival pancakes. Bakker is the go-to guy to shill End Times stuff, and Bickel is more than willing to partner with who is perhaps the most notorious false prophet alive to make an extra buck. You can watch the clip of Mike Bickel partnering with Jim Bakker to sell End Times stuff below. Please note that – as always – with “impressive” charismatic prophecies, there is no record of this prophecy when it was given. The supposed prophecy was only revealed retroactively. The crowd applauded wildly for a supposed prophecy which wasn’t revealed unto after these things came to pass. After telling these fanciful tales, they went on to sell Doomsday supplies. Convenient. 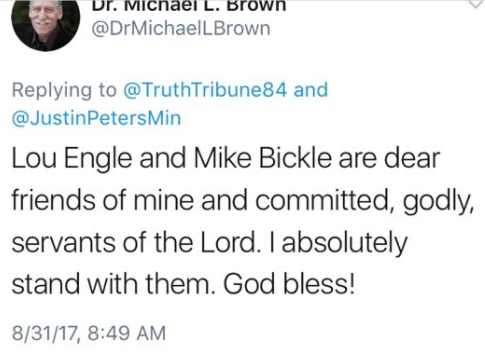 Oh, and just a reminder, that Mike Bickel still has the full support of hyper-charismatic prophet, Michael Brown. The charismatic movement is desperately sick. Please pray that your friends and family will walk away from charismaticism, and towards Biblical Christianity. That Much Further South: Who Still Supports Evangelist Clayton Jennings? Sexual Abuse and the SBC: Albert Mohler Folds, Paige Patterson Doubles Down.